Halo-halo is known as a king of filipino sweets. I love halo-halo so I had to find the best place to get it. I asked Paolo's local friends, hotel clarks and random people on the street and EVERYONE told me to go to HALO HALO DE ILOKO. If you want to get that one perfect bite of Halo-Halo, that's where you go. It is located in San Fernando, La Union. I was a bit hard to find because it's not on the main street of the city. When we got there, there actually was a big line of local people waiting outside. I was expecting Halo Halo de Iloko to be a small cafe that only sells Halo Halo but it was a lot more than that! It actually was a restaurant and the food there was actually real good! So here is the Sweets section of the menu. As you can see, there are several types of halo halo. I had no idea what to order so I asked for their recommendations. They recommended Buko, Fiesta, or Deep Fried Halo Halo. I had Fiesta which basically has everything and served in a tall glass like this. OMG, IT WAS BOMB! This actually is the best halo halo I have ever had in my entire life. You can taste the perfect balance of the saltiness and sweetness. So 'BUKO' means coconut in Tagalog. So Buko Halo Halo is basically Fiesta in a coconut shell. If you want to instagram it, this is your order. 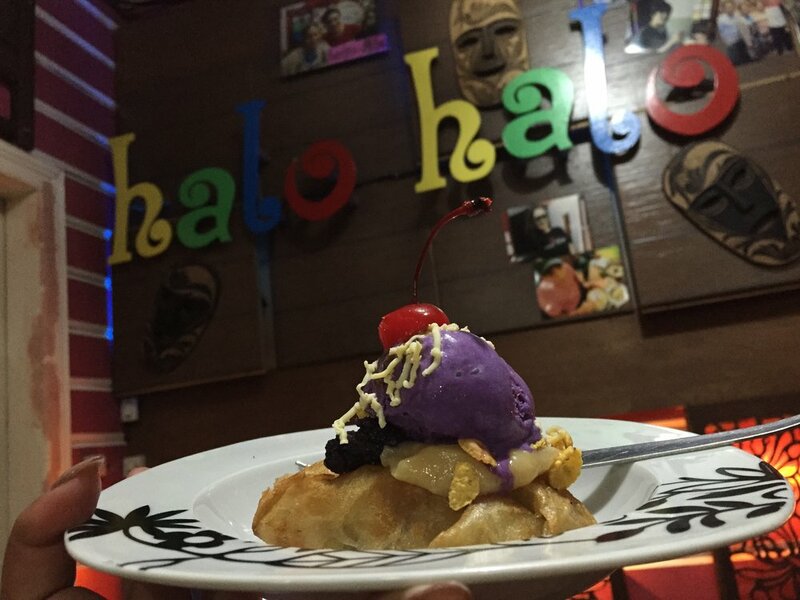 So Deep Fried Halo Halo is a fried crape and ube ice cream on top. Of course it is good. Deep fried sweet can never go wrong. When we go there next time, we must bring a big party and have a big meal because the food looked very good! Check out Paolo's vlog to see if you like the place! Let us know.